As restaurants and companies dealing in food production struggle to survive, a small industry is capitalizing on opportunity. Cost reduction services are thriving off the needs of business owners to reduce overhead anyway they can. One company in particular has positioned itself to profit from the increased demand for cost reduction, as well as capture the attention of sustainability managers looking to push corporate green initiatives.See how this business is paving the way for inevitable changes in the way businesses deal with green initiatives in the coming years. As struggling businesses look to cut costs, the small but growing industry of cost reduction services is flourishing in the current economic environment. In times like these, anything that helps a business lower its operation costs is going to be a welcomed service. Several companies are taking such needs all the way to the bank, but an oil filtration company known as The Filta Group found a particularly unique niche that combines the benefits of cost reduction with the social capital of going green for restaurants and commercial kitchens. Win-win situations are rare when environmental initiatives work in tandem with profit strategies, but the company based out of Orlando, Florida is succeeding by doing just that. 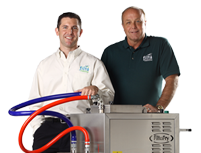 Called Filta, this green franchise focuses on environmental and efficiency solutions for restaurants and commercial kitchens. The company’s largest product is an oil microfiltration service, which allows cooking oil to be used effectively for a much longer period of time, thus improving food quality and the life of the frying systems. It is a service that most restaurants had never heard of until Filta Group started franchising their FiltaFry service in the 90’s. Oil filtration is exactly what it sounds like. The company uses a proprietary technology to filter impurities out of used cooking oil to extend its use life. The company says it can extend oil life by up to 50%, reducing costs for restaurants (far more than the cost of the service) while lowering their impact on the environment. According to Filta’s president Jason Sayers, the company has filtered over 250 million pounds of oil since it’s inception, or enough to fill an entire football stadium. That’s a tremendous positive impact on the environment, as well as the profits of thousands of restaurants and commercial kitchens. The word is beginning to spread. Starwood Hotel Brands, which includes the likes of Sheraton, Aloft, Westing, St. Regis, and other hotel leaders, entered a deal with the company recently to offer Filta’s services to the hundreds of hotel-managed restaurants and commercial kitchens in its management portfolio. A national agreement was reached with the hotel giant after a pilot program yielded an impressive 37% reduction in costs associated with frying oil processes or roughly $570,000 in savings. 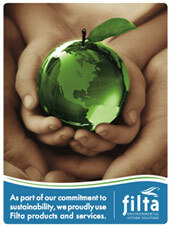 Staying true to its food service cost-reduction core, Filta has also just released a new service known as FiltaCool. This unique system utilizes passive moisture-controlling technology to increase refrigeration efficiency in restaurant coolers. The move is paying off for Filta and clients alike. Studies have shown the system’s ability to significantly increase the efficiency of refrigeration systems to control humidity and temperature, two major factors that help decrease energy costs in cold-storage. This passive and relaltively inexpensive service allows commercial kitchens, and restaurants to reduce operations costs even further than FiltaFry alone. If you have not yet seen a Filta mobile service van in your area, expect to see it soon. The company is barely keeping pace with the number of new requests for franchise information. In times like these, it is good to see any company thriving. Especially one that combines green initiatives with profitability. Companies like Filta are the next evolution in the new economy. They are proof that social responsibility and profit can be achieved at the same time.